Dice, Doubloons and Random Musings: What to Buy Next? Gina and I have been on hobby no-buy for the month of December - I can't buy toy soldier stuff (not even based or flock) and she can't buy knitting supplies. Well, one of her favorite indie yarn dyers put out an update last week and Gina would have been unable to purchase any of the one-of-a-kind skeins if she'd been forced to wait until January 1st - they would have been completely sold out. So we came to an agreement; I would turn a blind eye to her buying a few skeins of unique yarn, and she would turn a blind eye to me making a toy soldiers purchase AFTER Christmas - she's buying me some toy soldiers for Christmas so doesn't want me buying anything she might have picked out for me. 1.) Terrain for Frostgrave. I have two warbands and might be able to put together a third or more after Christmas, so I ought to get some terrain going for games. 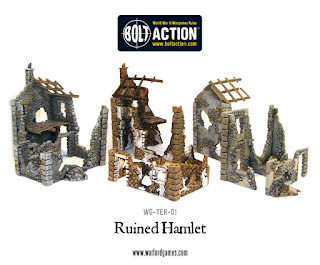 I'm eyeing a couple of Warlord Games' bombed out farmhouses from their Bolt Action line and maybe the snap-together gothic buildings that I think Pegasus Hobbies currently puts out. I'm curious to hear from readers who've built these structures about how the construction process went. 2.) Colonial/Victorian/Steampunk-appropriate figures from Wargames Foundry. I've been rereading Chris Palmer and Buck Surdu's Victorian Science Fiction skirmish game GASLIGHT lately, and I'm more impressed with them than ever. I haven't run GASLIGHT in years and don't have the figures from those long-ago days any more. I think I'd like to be able to run demo games of both GASLIGHT and Frostgrave at conventions by autumn 2016, and that means new armies need to be painted. Colonial-era games are tricky things in our current hyper-sensitive climate; it's too easy to get accused of ethnocentrism by putting on a game set in this era. I'm thinking a couple packs of Foundry figs would take advantage of their end of year 20% off sale, and build a force of Belgians (who were dastardly in their dealings in the Congo, no doubt) and some stalwart Brits to oppose them. I've got a pretty nice mental image of a demo game in which rival European expeditions racing to the entrance of King Solomon's Mines - which happens to be located in a "Lost World" valley populated by dinosaurs who don't care about the national origin of their next meal. The thing is, I'm not sure if I'm spreading myself too thin by dividing my time and money between two games; would it be better, I wonder, to focus solely on Frostgrave for now, get my warbands painted, and start playing the game, learning it as best I can before I start building armies for another game? Or would being able to go back and forth between working on the two games make me less likely to experience burn-out because I'd be painting a greater variety of figures? This is the first time I've ever really had the income to where I could work on two games at once. I'd love to hear others' experience, ideas and advice. The same old question, I've asked myself, do I or don't I buy another period. Basically you've had it Bill, them little Gremlins will eat away in your brain, then one day some figures will arrive in the post and you won't even remember buying them!!! I'll run out of periods and scales eventually Ray! Then I can rest easy! That's a lovely ruin for sure, Michael! 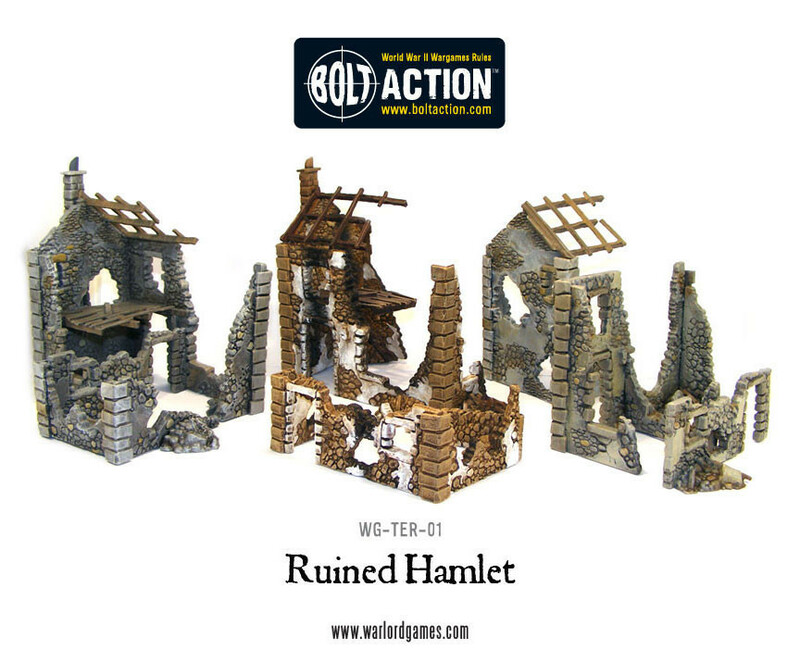 While the ruined hamlet is probably the best value, it would probably be wiser to buy a single farmhouse first and see if I like how the kit goes together.